Just Delete Me: How to delete your account on Amazon, Netflix, Skype, et al. Robb Lewis has color-coded major Web services according to how hard they make it to delete your account. Skype, Netflix, and Evernote are among the worst offenders. Some adventures are fun. Others are hellish and dispiriting. As a rule, the adventures that ensue when you try to figure out how to delete your account from a Web service like Amazon or Spotify are not the fun kind. They’re the kind that make you want to book a flight to Seattle just so you can hurl your computer through Jeff Bezos’ window. It was after marveling at some fed-up users’ tweets about how incredibly difficult it is to delete a Skype account that a U.K. developer named Robb Lewis decided to lend a hand. So he built a website that takes the adventure out of account-deletion. It’s called “Just Delete Me,” and it’s as simple as Skype’s account-deletion procedure is convoluted. 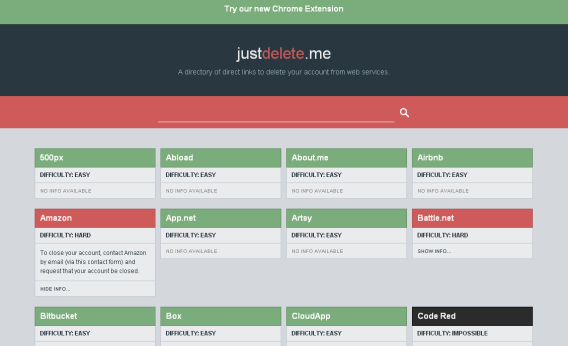 Go to justdelete.me and find the service from which you want to delete your account. Click on the service’s name and follow the instructions on the screen to delete your account.